Purpose: Musculoskeletal pain has been associated with work stress and a shortened career in the dental hygiene profession. The purpose of this study was to determine if participating in two yoga sessions per week would reduce the musculoskeletal pain reported by dental hygiene students and or impact body composition. Methods: A convenience sample of 77 dental hygiene students self-selected into treatment (yoga) and control groups. Students in the yoga group participated in bi-weekly, 60-minute yoga sessions for 13 consecutive weeks. Students completed a questionnaire and a Comparative Pain Scale evaluation prior to and immediately following the study period to assess musculoskeletal pain. Additionally, the Omron HBF-514C Full Body Composition Sensing Monitor and Scale was used to measure body mass index (BMI), body fat, and muscle prior to and upon completion of the study. Paired sample t-tests and independent t-tests were used to analyze the data. Results: Thirty-eight dental hygiene students, with an average age of 23.9 years, participated in the yoga group and 39 were assigned to the control group. The majority of the participants were Caucasian (63.6%) females (90.9%). Participants in both groups were of similar age, ethnicity, and had comparable pre-study Harich Comparative Pain Scale scores. After participating in the yoga sessions, the treatment group reported a significant decrease in musculoskeletal pain (p<0.001), while the control group reported no significant decrease in musculoskeletal pain (p=0.881). The yoga sessions did not significantly impact the BMI scores for the yoga treatment group (p=.984) or the control group (p=.901). Conclusion: This research supports the practice of bi-weekly yoga sessions as beneficial in decreasing musculoskeletal pain in dental hygiene students. Yoga can be considered a viable complementary health approach to incorporate into student schedules as a means of increasing the health and longevity of a dental hygiene career. Utilization of Complementary Health Approaches (CHA) has increased in recent years, 2002 to 2012, in the general population.9 Examples of CHA include: acupuncture, Ayurveda, chiropractic care, non-vitamin/non-mineral dietary supplements, massage, meditation, and yoga.9 Dental hygienists have reported using CHA, including yoga, to manage and reduce their work-related pain. Dental hygienists who used CHA had higher career satisfaction, increased career longevity, improved overall health and well-being, and were able to work their desired number of hours.4 The prevalence of CMSP in dentists who regularly practiced yoga was reported to be less when compared to those who participated in other types of physical activity.10 The incidence of CMSP in dental hygiene students who practice yoga has not been reported in the literature. CMSP is frequently reported by practicing dental hygienists and dental hygiene students.1-8 CMSP has caused dental hygienists to reduce the number of hours they work3,4,8 and even leave the profession.4 Research shows that pain can begin early while still in dental hygiene school.1,2,5-7 Dental hygienists have reported practicing yoga to reduce and manage their pain,4 and yoga has been shown to reduce pain among the general population.12-22 The purpose of this study was to determine if participating in two yoga sessions per week would impact the musculoskeletal pain reported by dental hygiene students and, or, impact body composition. Dental hygiene students enrolled in two universities, Minnesota State University, Mankato, Minnesota and West Coast University, Anaheim, California, participated in this study. Human subject approval was obtained from the respective Institutional Review Boards, and informed consent was obtained from all participants. A convenience sample of 83 students participated in this study, however, six participants were omitted during the data analysis due to incomplete survey responses, resulting in a sample size of 77 students (N=77). Participation in this 13-week study was voluntary and students could withdraw at any time. Data was collected over a two-year period, with 35 participants in year one, and 47 participants in year two. Students volunteered to participate in two Vinyasa flow yoga sessions per week, for one hour per session, and were assigned to the test group (n=38), the remaining participants were assigned to the control group (n=39). Both groups were instructed to continue their normal routines regarding physical activity. In order to examine the effect of yoga on body composition, heights were recorded for each participant, and the Omron HBF-514C Full Body Composition Sensing Monitor and Scale was used to measure weight, body mass index (BMI), body fat, and muscle prior to and upon completion of the study. Researchers have found measurements with the Omron scale to significantly correlate with BOD POD®, body composition results, (r=.95), albeit an overestimation of body fat.23 Paired sample t-tests and independent t-tests were used to analyze the quantitative data. A p-value <0.05 was used to determine statistical significant differences between the two groups. Participants (N=77) ranged in age from 19 to 37 years, with an average age of 23.9 years. The majority of the participants were Caucasian (63.6%) females (90.9%). Table I includes the specific breakdown for race/ethnicity. Eighty-seven percent of participants were in their 1st year of dental hygiene. Of the 77 participants, 36 resided in Minnesota and 41 resided in California. A majority (92.2%) of all the participants reported having experienced musculoskeletal pain since beginning the dental hygiene program. Over half (55.8%) of all participants were experiencing musculoskeletal pain once a week or more and 51.9% of the participants reported experiencing more musculoskeletal pain as compared to before entry into the program (Table II). At the time of the post-survey, 65.8% of participants in the yoga treatment group reported less musculoskeletal pain after participating in the study, compared to 7.7% of the control group. During the post-survey, 20.5% of participants in the control group reported more musculoskeletal pain as compared to only 2.5% of participants in the yoga treatment group. In separate questions specific to the yoga group, 71.8% felt their pain was somewhat to much better after participating in yoga, and 81.5% would participate in yoga again. In comparing yoga to previously used medication or other therapies to treat musculoskeletal pain, 57.9% of the treatment group preferred using yoga. Headaches or migraines are common with 84.4% all participants reported experiencing headaches or migraines since starting the dental hygiene program. Table II illustrates the headache/migraine frequency with 40.2% of all participants experiencing one or more episodes each week. Since starting the program, 46.1% of participants reported experiencing more headaches or migraines than before entering into the program. Similar to the reduction of musculoskeletal pain, 52.6% of participants in the yoga treatment group reported fewer headaches or migraines after participating in the study as compared to 7.7% of the control group. Participants identified current and previous levels of pain for various body areas, while also indicating if they have experienced pain during dental hygiene school (Table III). The most common areas of current pain reported on the pre-surveys include the lower back (40%) and the neck (37.7%), with the hip and upper arm/elbow the least commonly reported. The location of the pain experienced by students in the treatment and control groups, pre and post survey, is shown in Table IV. In the yoga treatment group, there was a decrease in number of participants reporting current pain in the post-survey for all body areas with the exception of the shoulder and upper arm/elbow. For the control group, there was an increase in number of participants reporting current pain in the post-survey for all body areas except for the hip. Paired sample t-tests were used to compare the number of participants who reported current pain in each body area between the pre- and post-surveys. Significantly fewer participants in the yoga group reported current pain in the lower back after completion of the study as compared to the pre-surveys (p<0.001). No other significant differences were found in the yoga group. The only significant difference reported in the control group was an increased number of participants reported pain in the lower arm on the post-survey as compared to the pre-survey (p=0.005). 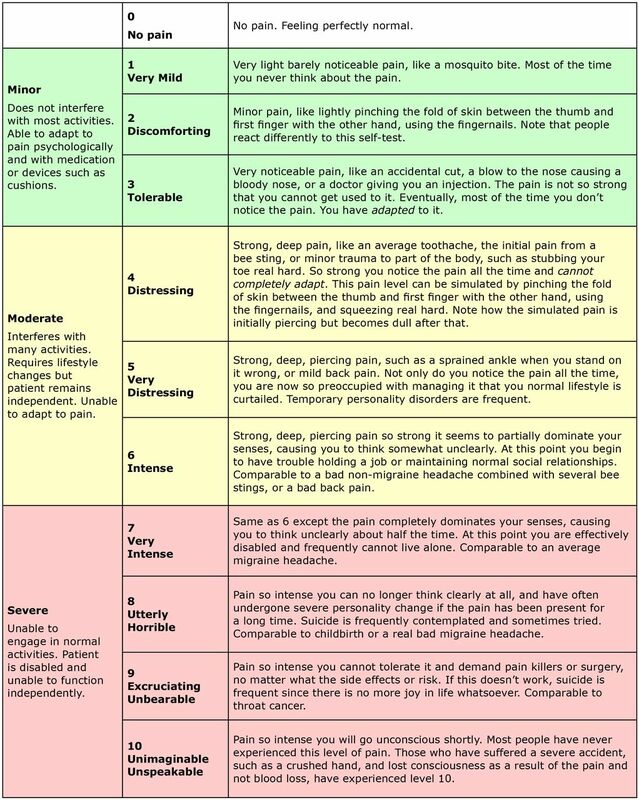 In addition to reporting frequency and pain per body area, partici pants determined their overall level of musculoskeletal pain using the Harich Comparative Pain Scale. Pre-study participants (N=77) self-reported pain scores ranged from 0 to 5 (very distressing), with a mean score 1.88 (discomforting). Only 11.7% of the participants identified as having “no pain” on the Harich Comparative Pain Scale. Post-study participants (N=77) self-reported pain scores ranging from 0 to 5, with a mean score of 1.42 (between very mild and discomforting). Participants in the yoga group (n=38) and the control group (n=39) were similar in pre-study pain levels with no significant difference (p = 0.175) found using an independent t-test. While both the treatment and control groups self-reported lower pain scores in the post-study as compared to pre-study surveys, a significant difference (p < 0.001) in scores was found using the paired sample t-test for the treatment group only (n=38). The paired sample t-test did not demonstrate a significant change in level of musculoskeletal pain reported before and after the research study (p= 0.586) for the control group (n=39). Specific results from the paired sample t-tests are shown in Table V. In order to further examine pain reduction, paired sample t-tests were used a second time excluding any participants who reported a pain level of 0 in the pre-study survey. Again, a significantly lower self-reported pain score (p < 0.001) was found in the treatment group (n=33), and was not significant (p=0.128) in the control group (n=38). Heights were recorded for each participant prior to and upon completion of the study. The Omron HBF-514C Full Body Composition Sensing Monitor and Scale was used to measure weight, body mass index (BMI), body fat percentage, and muscle percentage (N=77). Pre-BMI scores ranged from 17.1 to 43.5, with a mean BMI of 23.8. Pre-body fat scores ranged from 13.8% to 53.5%, with a mean of 33.1%. Pre-muscle percentage scores ranged from 21.1% to 44.2%, with a mean of 28.6%. Paired sample t-tests were used to examine any differences in BMI, muscle percentage, and body fat percentage. For the control group (n=39), no significant differences were found in BMI (p=0.901), muscle percentage (p=0.274) or body fat percentage (p=580). There were also no significant differences in the yoga group for BMI (p=0.984), muscle (p=0.201), or fat (p=0.566). CMSP has been reported by practicing dental hygienists and dental hygiene students,1-8 and yoga has been shown to reduce chronic neck and low back pain among the general population.12-22 CMSP is a concern for the dental hygiene profession as practitioners have reported reducing their work hours, taking time off, considered changing careers,3,4,8 and have left the profession4 due to chronic pain issues. Dental hygiene students in the treatment group (65.8%) who practiced yoga twice a week for one hour per session reported significantly less pain when compared to the control group (7.7%). Likewise, dentists have reported less pain with a regular yoga practice.10 These findings are similar to the general population who reported less pain with a weekly yoga practice for 90 minutes in duration.12-22 The general population had a significant reduction in neck pain when yoga was practiced weekly for 9 weeks.12 A significant reduction in back pain has been reported after 12 weeks of practicing yoga,16,18,19,21 which is similar this study where dental hygiene students reported significantly less pain after 13 weeks. Dental hygiene students reported increased pain (51.9%) since starting the program in this study, which is similar to previous research where students reported an increase in pain over a three-year span.1 Practicing dental hygienists have reported that CHA are acceptable for pain management and as an alternative to conventional medicine4 which is similar to these findings where dental hygiene students preferred yoga (57.9%) to treat their pain when compared to conventional medicine. While this study primarily focused on musculoskeletal pain, information was collected regarding frequency of headaches and/or migraines, along with body composition. This study revealed that 40.2% of dental hygiene students are experiencing headaches/migraines at least 1-2 times each week. Headaches and migraines have a variety of predisposing factors including nutrition, changing sleep patterns, poor posture, stress, and secondary factors resulting from disease/illness.24 This study suggests that yoga may be useful in reducing the frequency of headaches/migraines with 52.6% of participants in the yoga treatment group reporting fewer headaches or migraines following the study as compared to 7.7% of the control group. No significant differences were found in body composition between the pre and post-study statistics for either group. Many factors influence body composition including nutrition, aerobic exercise and strength training. The authors are not suggesting that yoga is ineffective in changing body composition, however this study was not designed to incorporate nutrition and strength training which could have impacted body composition. More research is needed to determine how regular yoga practice might influence body composition as well as headaches/migraine frequency in dental hygienists. One limitation to this study was that students were not asked to practice yoga outside of the twice weekly scheduled sessions, while previous studies asked participants to practice at home in addition to the weekly scheduled session.12-16,18,19,22 Additional practice at home could have increased the amount of pain reduction. Another limitation was that the yoga instructors were not calibrated on the yoga poses taught to the students, although the particular style of yoga instruction was the same. Teaching a specific set of yoga poses may have created a different result. Yoga class attendance may have also influenced the overall amount of pain reduction. Some participants missed a weekly class session and were asked to make up the session at home with an assigned video. Having regularly scheduled make-up class with the instructor may have prevented the students from missing sessions during the study. In addition, a live class, as opposed to watching a video, is beneficial since the instructor is able to guide the participant into proper alignment and aids in injury prevention. Future research should include studies on ergonomic and CSMP assessments in the clinical dental hygiene education setting and incorporation of yoga into the curriculum. Students could also be required to practice yoga independently, with hand-outs or videos, following the conclusion of formal class sessions with a follow-up assessment on prolonged pain reduction at six months post-study. This would be similar to previous studies assessing the long-term effects of a regular yoga practice six months following structured instruction sessions.14,19,21 A follow-up questionnaire after one year in clinical practice would be beneficial to assess pain levels and determine if dental hygienists continued to practice yoga after the initial exposure to yoga in dental hygiene school. This study found that CMSP starts during the first year of dental hygiene school, and practicing yoga twice a week significantly reduced pain in a dental hygiene student population. Proper ergonomics should be reinforced in the clinical setting to prevent pain from occurring, and may also prolong the effects of a regular yoga practice. Students should be aware that CMSP has important implications for career longevity and incorporating yoga into the dental hygiene curriculum should be considered. Practicing dental hygienists may also benefit from yoga practice as part of their daily lifestyle. The authors thank PRN Dental Pros, LLC for the financial donation to hire a certified yoga instructor in Mankato, MN. Angela L. Monson, RDH, PhD, is a professor and department chair in the Dental Hygiene Department at Minnesota State University, Mankato, MN; Aubreé M. Chismark, RDH, MS, is an associate professor in the dental hygiene department at West Coast University in Anaheim, CA and a Registered Yoga Teacher with the Yoga Alliance; Brigette R. Cooper, RDH, MS, is an associate professor and Trisha M. Krenik-Matejcek, RDH, MS, is an assistant professor; both are in the Dental Hygiene Department at Minnesota State University, Mankato, MN.
. Musculoskeletal disorders in a 3 year longitudinal cohort of dental hygiene students. J Dent Hyg [Internet]. 2014 [cited 2016 Jan 31];88(1): 36-41. Available from: http://www.adha.org.
. Musculoskeletal disorders and symptom severity among Australian dental hygienists. BMC Research Notes [Internet]. 2013 [cited 2016 Jan 31];6:250. Available from: http://www.biomedcentral.com/1756-0500/6/250.
. Predictors of work-related musculoskeletal disorders among dental hygienists. Int J Dent Hyg. 2012 Nov;10:265-69.
. Use of complementary and alternative medicine for work-related pain correlates with career satisfaction among dental hygienists. J Dent Hyg [Internet]. 2011 [cited 2016 Jan 31];85(4):273-284. Available at: http://www.adha.org.
. Causes of musculoskeletal disorders in dental hygienists and dental hygiene students: a study of combined biomechanical and psychosocial risk factors. Work. 2010;35: 441-54.
. Prevalence and correlates of musculoskeletal disorders among Australian dental hygiene students. Int J Dent Hyg. 2009 Aug;7:176-81.
. Musculoskeletal disorders of the neck and shoulder in dental hygienists and dental hygiene students. J Dent Hyg [Internet]. 2007 [cited 2016 Jan 31];81(1):e16. Available from: http://www.adha.org.
. Relationship of musculoskeletal disorder pain to patterns of clinical care in California dental hygienists. J Dent Hyg. 2015 Oct;89(5):305-12.
. Yoga for chronic neck pain: a 12-month follow-up. Pain Med. 2013 Apr;14:541-48.
. I'm more in balance: a qualitative study of yoga for patients with chronic neck pain. J Altern Complement Med. 2013 June;19(6):536-42.
. Yoga for reducing perceived stress and back pain at work. Occup Med. 2012 Dec. 62:606-12.
. Comparing once- versus twice-weekly yoga classes for chronic low back pain in predominantly low income minorities: a randomized dosing trial. Evi-Base Comp Alt Med [Internet]. 2013 [cited 2016 Jan 31];Article ID 658030:13pages. Available from: www.hindawi.com/journals/ecam/2013/658030/.
. Effect of occupational therapy and yoga in chronic low back pain. Ind J Occup Ther. 2012 May-Aug;44(2):13-20.
. A randomized trial comparing yoga, stretching, and a self-care book for chronic low back pain. Arch Intern Med [Internet]. 2011 [cited 2016 Jan 31]. Available from: http://archinte.jamanetwork.com/article.aspx?articleid=1106098.
. Yoga for chronic low back pain. Ann Intern Med [Internet]. 2011 [cited 2016 Jan 31]; 155(9):569-78. Available from: http://annals.org/issue.aspx?journalid=90&issueID=20366&direction=P.
. Evaluation of the effectiveness and efficacy of Iyengar yoga therapy on chronic low back pain. Spine. 2009 Sep;34(19):2066-76.
. Yoga and pilates in the management of low back pain. Curr Rev Musculoskeletal Med [Internet]. 2008 [cited 2016 Jan 31];1:39-47. Available from: http://link.springer.com/article/10.1007/s12178-007-9004-1/fulltext.html.
. Accuracy of the Omron HBF-500 body composition monitor in male and female college students. Int J Exerc Sci [Internet]. 2011 [cited 2015 Dec 15];4(1):93-101. Available from:http://digitalcommons.wku.edu/cgi/viewcontent.cgi?article=1249&context=ijes. Headache. Mayo Clinic. 2016 [cited 2016 June 17]. Available from: http://www.mayoclinic.org/symptoms/headache/basics/causes/sym-20050800. Yoga Poses. YogaJournal.com [Internet]. 2016 July [cited 2016 July 9]. Available from: http://www.yogajournal.com/category/poses/contraindications-modifications/back-injury. Yoga Poses. YogaJournal.com [Internet]. 2016 July [cited 2016 July 9]. Available from: http://www.yogajournal.com/category/contraindications-modifications/neck-injury. Yoga Poses. YogaJournal.com [Internet]. 2016 July [cited 2016 July 9]. Available from: http://www.yogajournal.com/category/contraindications-modifications/shoulder-injury. Yoga Poses. YogaJournal.com [Internet]. 2016 July [cited 2016 July 9]. Available from: http://www.yogajournal.com/category/contraindications-modifications/carpal-tunnel-syndrome-contraindications-modifications.